Following last week’s wake-up of the Rosetta comet-chaser, ESA’s flight controllers have conducted the first in a series of health checks aimed at assessing how well it came through 31 months of hibernation. Rosetta spacecraft. Credit: ESA - J. Huart. 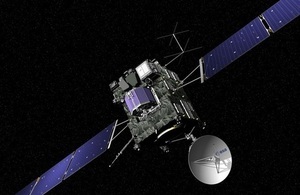 After its long deep-space hibernation, Europe’s Rosetta spacecraft woke up on 20 January to begin the final leg of its 10-year journey to comet 67P/Churyumov–Gerasimenko. Its first signal was received at 6:18pm GMT (7:18pm CET) at ESA’s control centre in Darmstadt, Germany. Receipt confirmed that Rosetta had exited hibernation, warmed up and – as planned – switched itself into ‘safe mode’, a basic level of functionality, transmitting a simple radio tone via its S-band transmitter and waiting for instructions from Earth. Within several hours, the Flight Control Team had established full control, switching on the more powerful X-band transmitter. This allowed high-rate housekeeping information to provide a detailed look at the health and status of crucial propulsion, attitude-keeping and power systems, among many others. After several days of detailed checks, the team have determined that the rest of the comet-chaser’s systems are also working as expected. Reactivation of 3 of the 4 reaction wheels – spinning gyroscopes used to control attitude – went flawlessly. The fourth wheel should be reactivated in the coming weeks. The next few weeks will be dedicated to testing and configuring onboard flight systems, including the solid-state mass memory, used to store science and operations data prior to download. Catching Rosetta’s wake-up signal using one of NASA’s 70 m-diameter dishes was not without challenges. Even after 31 months of no contact, however, the team at ESOC could predict the spacecraft’s location in the sky to within just 2000 km at a distance of 807 million km – equivalent to a tiny fraction the size of a full Moon. The next phase, lasting through April, will see science teams recommissioning Rosetta’s 11 scientific instruments. This will be done on individual schedules coordinated by the Rosetta Mission Operations Centre in ESOC. In March, Rosetta’s lander, Philae, will also be switched on for the first time since hibernation. It, too, will be recommissioned to confirm its control systems and 10 instruments are working. “Over the next three months we will be making sure that each instrument is ready to perform once we finally arrive at the comet, after 10 years journeying through the Solar System,” says Fred Jansen, Rosetta Mission Manager. Starting in February, status updates will be posted regularly in the [Rosetta blog] (http://blogs.esa.int/rosetta/).